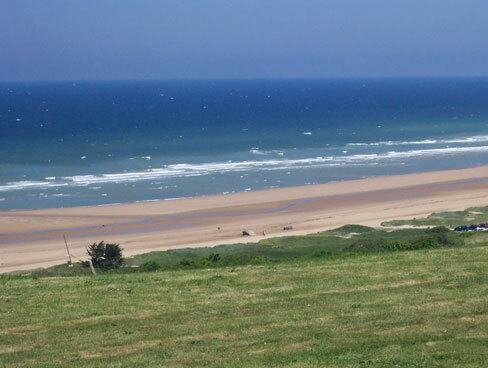 There’s something for all ages along the Battle of Normandy driving routes. Gillian Thornton got behind the wheel. Poised on the tip of the Manche peninsula, Cherbourg has always been important in times of war. The vast outer walls of Europe’s largest artificial harbour were commissioned by Napoleon Bonaparte in the 18th century and, in the summer of 1944, possession of the port meant win or lose to the Allies. 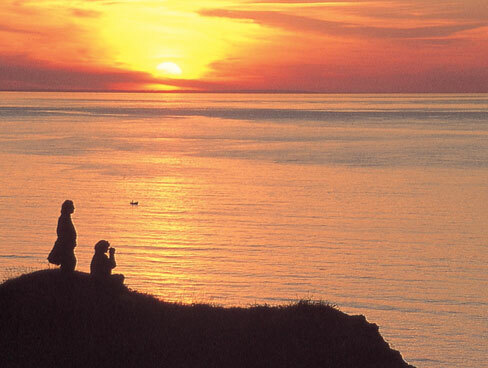 Drive out of town today and the rural landscape of small hedge-fringed fields or bocage gives way to the protected reserve of the Cotentin and Bessin marshes – a delightful spot to go walking, cycling or birdwatching. But in the summer of 1944, this area was anything but peaceful. German troops had occupied Cherbourg since June 1940 and it was nearly two months after D-Day before the Allies gained control. Seventy years on, Cherbourg is the starting point for two of the eight self-drive trails that link key sites and events from the Battle of Normandy; two more start near the Brittany Ferries terminal at Caen-Ouistreham. All clearly signposted, they are colour-coded, chronologically themed and dotted with interactive information posts that can be scanned using a special app. Just pick up the free booklet – 1944: Exploration and Emotion – from any Tourist Office. 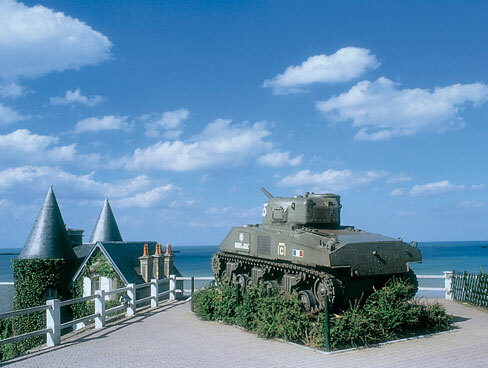 Together the Battle of Normandy trails form an unbroken loop through the departments of Calvados, Manche and Orne, binding key sites and events into one easy-to follow package. But they’re not just for military historians. If you’ve younger travellers in tow, you can easily dip in and out of the trails to visit not just the battlefield sites, but other attractions along the way. 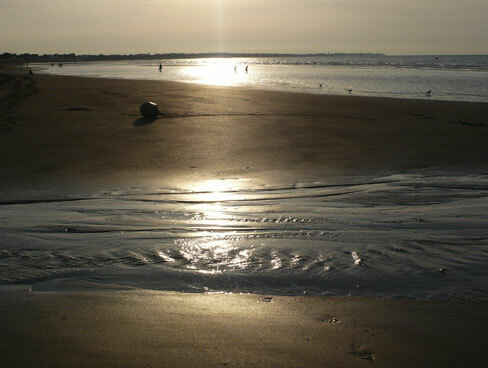 Three of the trails, for instance, hug the shore of the D-Day landing beaches codenamed Utah, Omaha, Gold, Juno and Sword. While the seaside trails are dotted with military museums and memorials, they are also liberally sprinkled with tempting small resorts and glorious golden beaches that are just perfect for family stopovers. If the kids like their history a little older, there is plenty of medieval fun to be had in the footsteps of William the Conqueror, who ruled the area 900 years before D-Day. 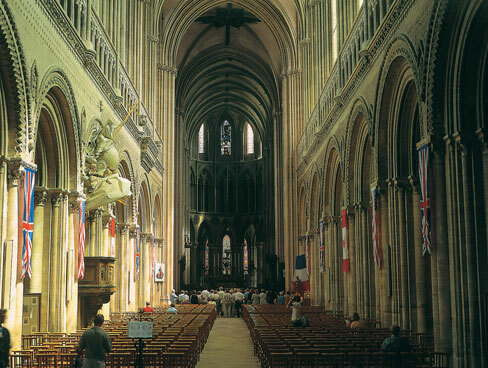 Visit his birthplace and his father’s castle in Falaise; his own ducal castle and final resting place in Caen; and the ‘tapestry’ that’s really an embroidery in Bayeux. Horse lovers meanwhile can feast their eyes on the beautiful occupants of the National Studs in Saint-Lô and the Haras du Pin near Argentan. Visit in spring and you’ll see mares and foals grazing beneath the apple blossom across Orne and Calvados; visit between 23rd August and 27th September and you might catch an event in the Alltech FEI™ World Equestrian Games. Children can get involved with events that took place here 70 years ago through 21st century technology using smartphone apps and GPS. 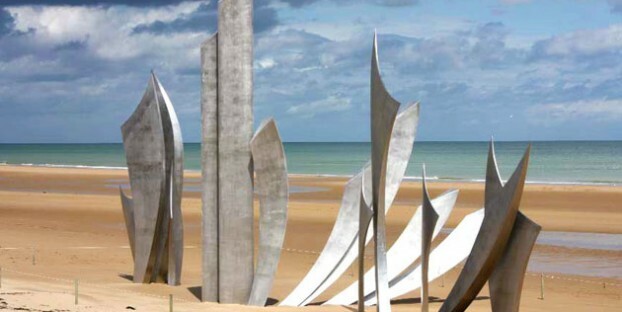 Head south-east out of Cherbourg, for instance, on the orange trail to Utah Beach (Objectif un Port), and at Carentan you can pick up a 40km circular trail and follow in the footsteps of the 101st Airborne Division using GPS navigation. Or for a handful of euros, rent an Open Sky Museum visioguide to 11 key sites around Sainte-Mère-Eglise from the Tourist Office. Alternatively go green and cycle out of Cherbourg and follow Cobra-La Percée to wind down the centre of the peninsula to Avranches. Here the red route (La Contre-Attaque) heads eastwards to Alençon, for the start of L’Encerclement, which follows the direction taken by the Allies through Montormel to trap the retreating enemy. Whenever I drive through Normandy’s lush orchards and meadows, I can’t help but marvel at nature’s power to regenerate after the devastation of war, and in few places is this more apparent than at Mont-Ormel, between Chambois and Vimoutiers. Here the hilltop visitor centre looks out over quiet countryside that in August 1944 saw the final stages of the Battle for Normandy. Mont-Ormel also lies on Le Dénouement, which traces the steps of the Allies between Caen and L’Aigle as they fought to open the route to the Seine. The visitor centre is also the starting place for a new August ‘44 trail, which follows the ‘Corridor of Death’ taken by the retreating enemy, and a smartphone app available this spring will provide extra insight along the 12-mile drive. For anyone whose World War II history is limited to the landing beaches of Operation Overlord, these inland trails bring a whole new dimension to a battle that raged for 100 days after D-Day. Fewer veterans remain with every passing year, but the Battle of Normandy driving routes will ensure that subsequent generations will never pass this way without remembering.